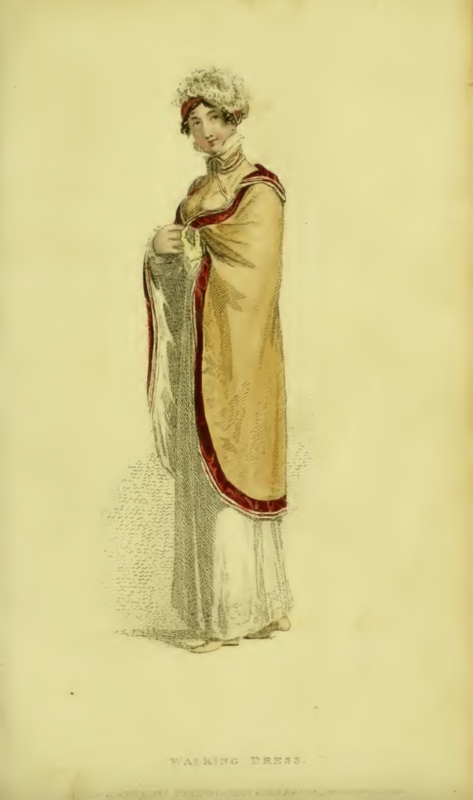 Decorative trims are the highlight of February 1814’s two fashion plates. The bottom of the gown in Plate 11, an “Evening or Dancing Dress,” features not one but three rows of trim: a row of blue satin or velvet in “puffs” is sandwiched between two rows of puckered net. This triple trim is mirrored on the cuffs of the gown’s short sleeves. On her head our lady wears a “large transparent Mechelin veil” which looks remarkably similar to the swags of lace decorating what looks to be a refreshment table beside her. I hope she doesn’t mistake one for the other and sweep up a dish of fruit instead of her veil . . . 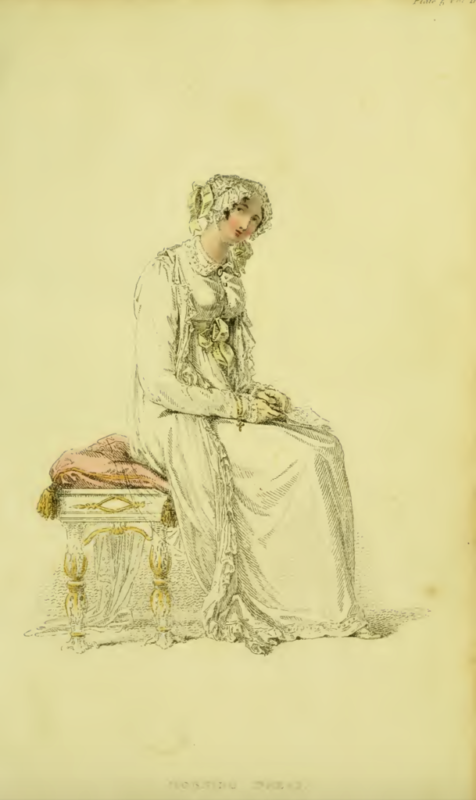 Plate 12’s gown is decorated with “a deep border of needlework round the bottom”—perhaps embroidered in the larger needlework pattern of the two featured at the back of this month’s magazine (see below)? I got a bit excited when I saw the lady in Plate 12; at first glance, it appears she has red hair! (yes, I’m a redhead, and proud of it). But alas, the splash of color is merely the “morone velvet” lining the lady’s “helmet bonnet,” which matches the trim on her Russian mantle. When you look more closely, you can see that her hair is a very ladylike brown. 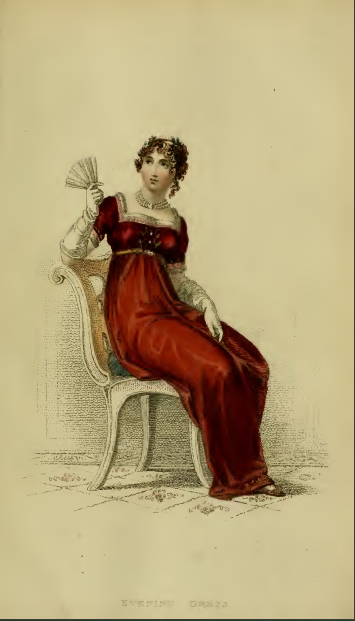 I should have known better; despite the many historical romance novels that feature redheaded heroines, prejudices against red hair that had been prevalent since the Middle Ages (red hair being associated with Jewishness) had not at all abated by the Regency. 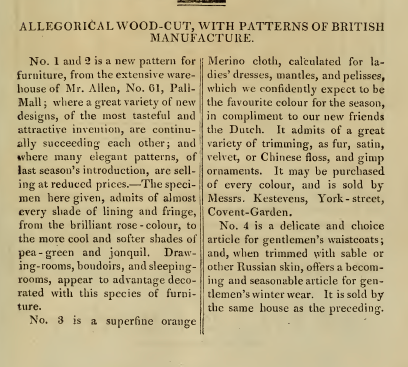 One of the fabric samples featured in the the December 1813 issue of Ackermann’s Repository was an orange wool, the color of which the writer noted “we expect to be the favourite colour of the season, in compliment to our new friends the Dutch” (see last week’s post for more on why the English and the Dutch were now “new friends”). 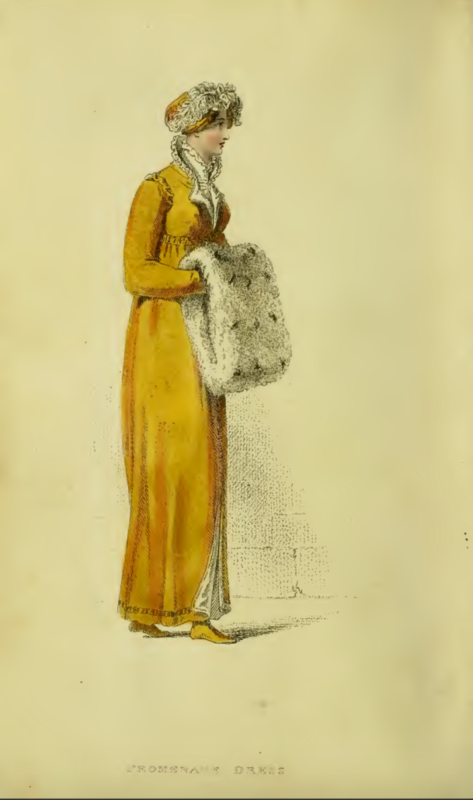 And, lo and behold, the first fashion plate for January 1814 features an orange coat! 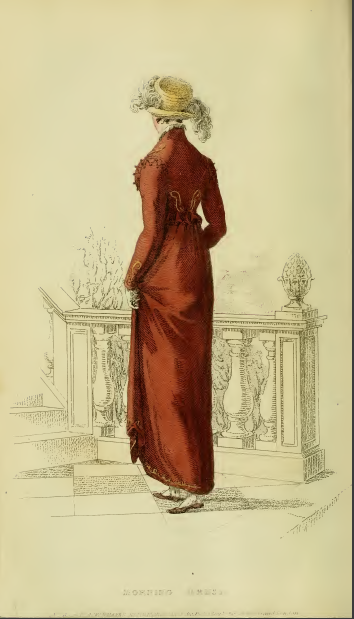 “A Spanish lapeled coat of fine orange merino cloth” covers a fine cambric gown in Plate 4. Even the lady’s half-boots are made from orange jean. Swans, ermines, and geese have also contributed to the celebration, in the form of trim for the coat, fur for the muff, and a jaunty feather for the hat. 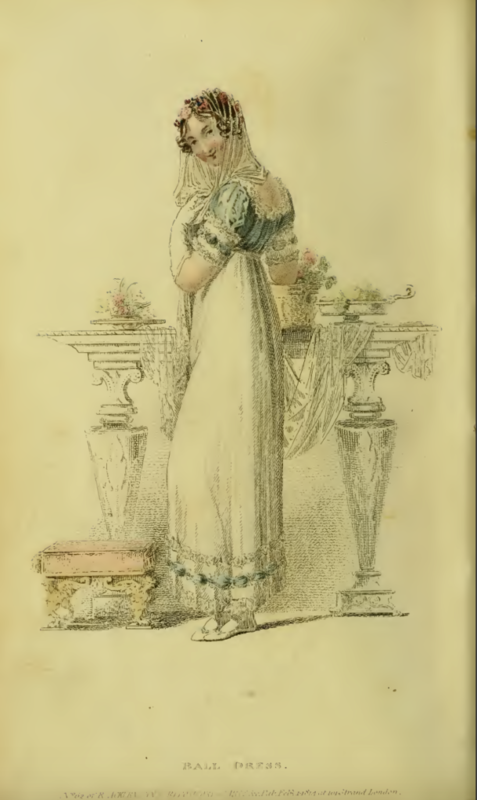 Plate 5 features a white “Morning Dress,” which, with its lemon-colored trimmings, slippers, and gloves, makes for a complimentary companion to the striking orange of plate 6. I’m wondering just what a “Flushing” mob cap is—anyone have any ideas? This month’s magazine does not include any fabric samples. 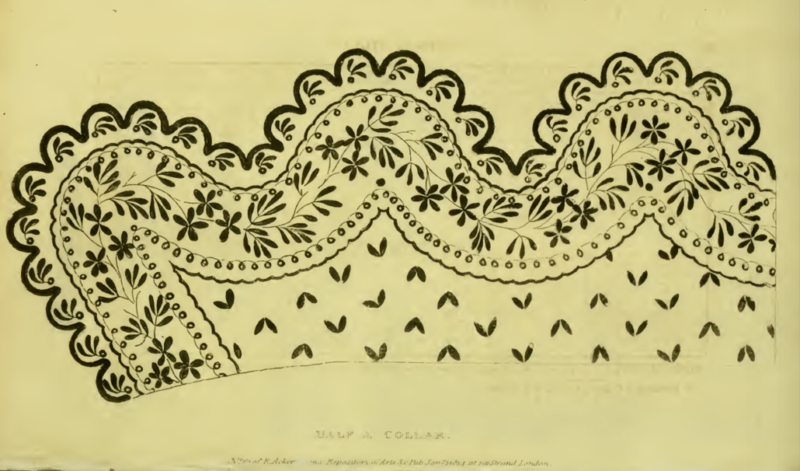 Instead we have this lovely pattern of needlework for a “half collar.” I’m working on hand sewing a man’s shirt for the cover model for my next book, and it is painstaking work. 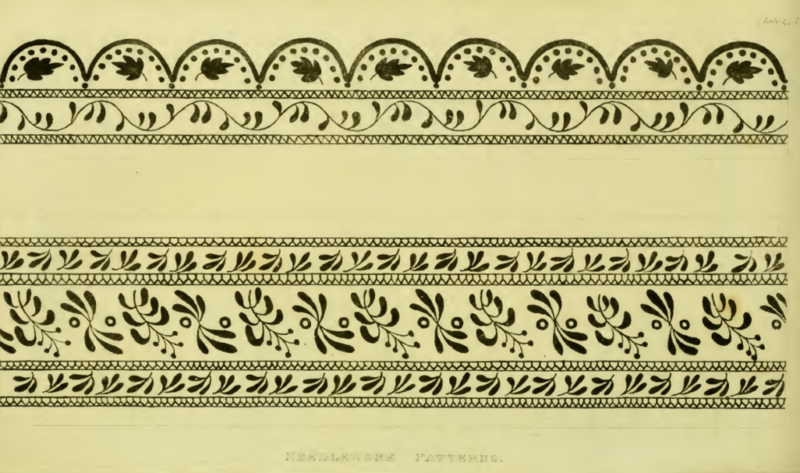 I can only marvel at the skill of a person who could embroider a pattern like this just to decorate the top of a collar! 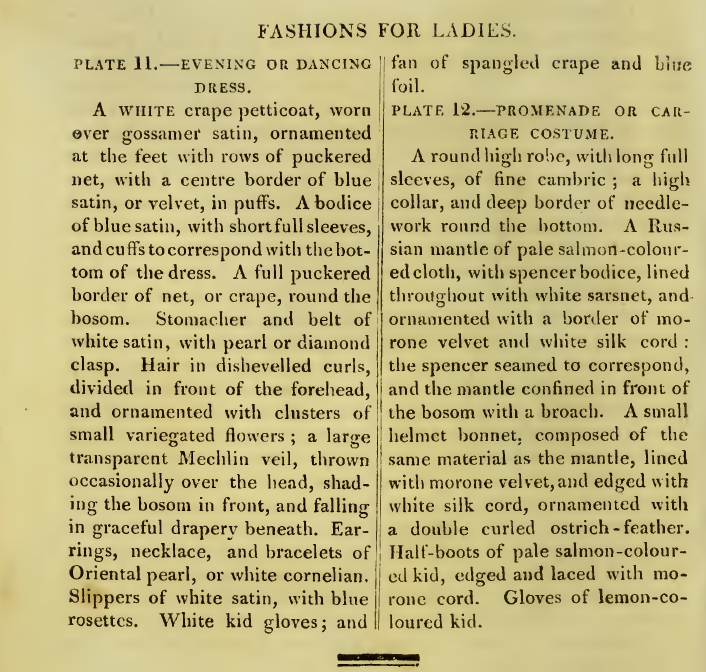 This month’s two fashion plates are really two views of one outfit: the Promenade or Carriage Costume of plate 40, which, when “divested of the spencer, or jacket, exhibits” the Evening or Opera Costume pictured in plate 41. Both here are crafted of “morone or crimson-colored Merino, kerseymere, or queen’s cloth,” to keep the wearer warm during the first month of winter. 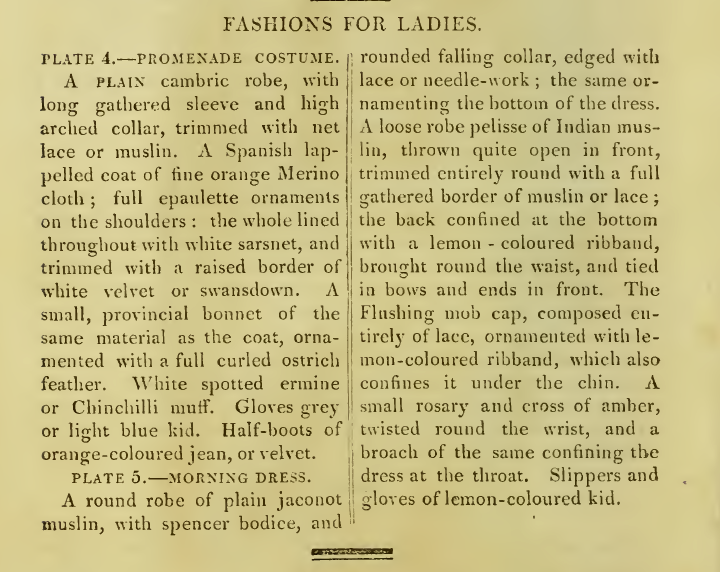 Fairchild’s Dictionary of Textiles defines “queen’s cloth” as “a term used in Jamaica, West Indies, for a type of fine, bleached cotton shirting,” which seems an odd alternative for Merino or kerseymere; perhaps “queen’s cloth” meant something different to the readers of Ackermann’s? 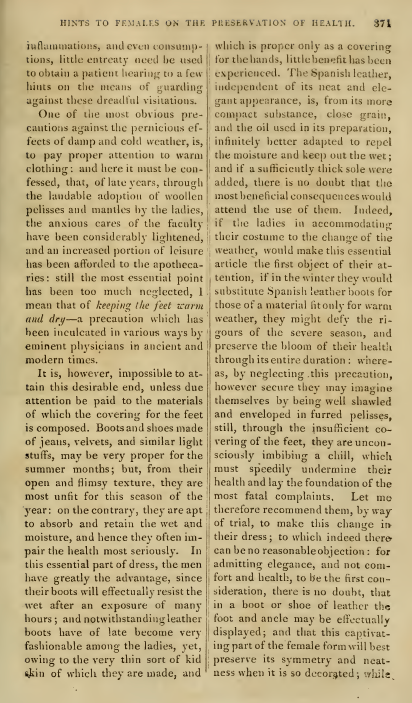 While the slippers depicted in plate 41 are described as “of crimson velvet, ornamented with gold fringe and rosettes,” our writer “recommend[s] those of white satin in preference.” Said writer also recommends a different pair of shoes be worn once the spencer of plate 40 is donned for outdoor travel: “half-boots or Roman shoes.” Did footmen typically take and store not only coats and hats, but boots as well after ladies changed into their more dainty footwear? 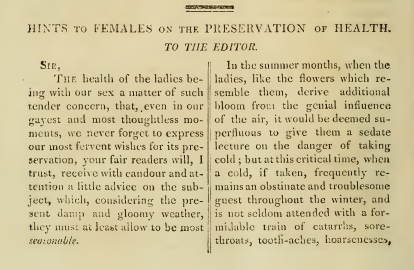 Or did the ladies somehow tuck them inside their reticules? One of the fabric samples from this month’s volume seems to have been torn out of the page from the Philadelphia Library of Art’s volume. But the two remaining samples are jaunty enough to compensate somewhat for its loss. 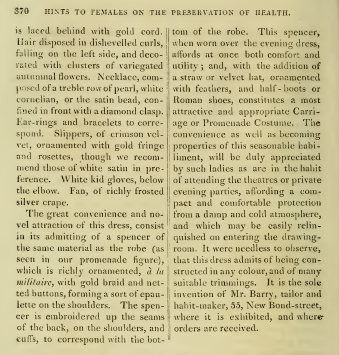 The first, a “new pattern for furniture,” “admits of almost every shade of lining and fringe, from the brilliant rose-colour to the more cool and softer shades of pea-green and jonquil.” I never thought of rose as a more brilliant shade than green or yellow, but perhaps those who lived at the time of the Regency did? 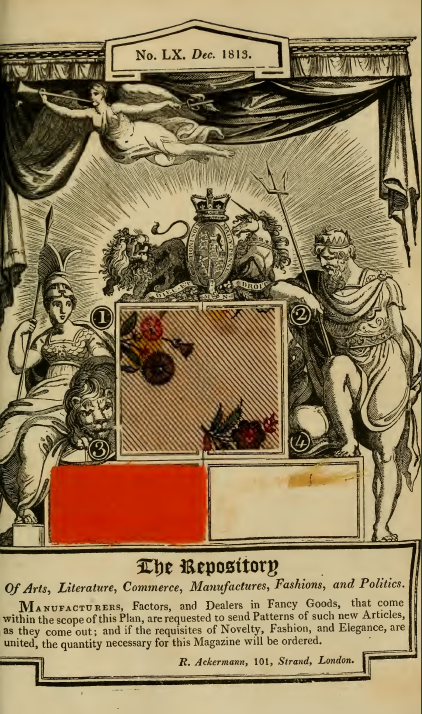 Even more brilliant is the orange of the superfine Merino cloth of sample #3, “which we expect to be the favourite colour of the season, in compliment to our new friends the Dutch.” Napoleon had named his brother Louis Bonaparte king of Holland in 1806, then later forced him to abdicate and annexed the kingdom to France. But Napoleon’s defeat at Leipzig in October 1813 led to a Dutch uprising. And on November 21, 1813, a provisional Dutch government was created on behalf of the William of Orange, who was then living in England. 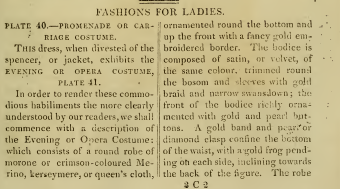 Will 1814’s fashion plates feature orange gowns?